NEW for the 2019 Queen City Century: Cyclists with disabilities and companions–ie, tandem captains riding with a visually impaired stoker, or generally anyone riding with or assisting a rider with a disability–ride the Queen City Century FREE. That includes any cyclist with a disability or, for example, veterans with a disability who want to participate in the Queen City Century. We were inspired by the work of Cycle St. Louis, who have been doing amazing working to encourage and enable more people with disabilities to be able to cycle in St. Louis-area bicycle events. Cycle St. Louis partnered with Trailnet to make all Trailnet rides this year more accessible to people with disabilities, and to provide free registrations for riders with a disability and companions. Is the Katy Trail or the Rock Island Trail flooded or closed? Here is how to find out . . . Flood waters have been high this year in Missouri. Much of the Katy Trail and Rock Island Spur are along rivers or in low-lying areas--and some of those areas are prone to flooding. So you're planning a traip. Is the trail closed or open? Amanda Grimes of UMKC and the BikeWalkKC Board of Directors has developed a survey for Missouri driver license holders. It is designed to measure drivers' knowledge of Missouri's bicycle laws. 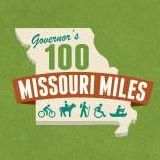 We would like to see as many Missouri drivers complete the survey as possible (ALL drivers, not just bicyclists) because it will go a long way to inform us about driver awareness of Missouri bicycle laws. Please take the survey yourself--and help us spread the word about the survey any way you can. Missouri State Parks recently completed a series of three public meetings to accept public feedback about the future of the 144-mile Rock Island Trail corridor between Windsor and Beaufort, Missouri. Through November 30th, 2018, State Parks is inviting the public to submit comments about the future of the corridor. We feel very strongly that these public comments will play a large part in determining the future of the corridor--and whether State Parks accepts the corridor for development as a future cross-state trai llink. Please take a few minutes to leave a public comment in support of the Rock Island Trail. You can read the information State Parks presented at the public meetings here. You can leave a public comment in support of the Rock Island Trail here (through Nov 30th, 2018). Recently Streetsblog USA reported that the Kansas City Star is endorsing Prop D, the proposal to raise Missouri's fuel tax, proceeds going to MoDOT, cities, and counties. Great Rivers Greenway and the City of Webster Groves invite area residents to celebrate the newest segment of the Deer Creek Greenway at a community celebration and ribbon cutting on Saturday, Oct. 13, 2018. The event will take place from 10 a.m. to noon in the northern section of Lorraine Davis Park, which is located between Waymire and Thornton Avenues in Webster Groves. The project extends the existing 0.7-mile paved greenway, between Deer Creek Shopping Center at Big Bend Blvd and Webster Groves Deer Creek Park, an additional 1.5 miles along Pacific Avenue, through Barnickel Park to Lorraine Davis Park, ending at Ravine Avenue. New trees, shrubs, native grasses and benches can be found along the paved, ADA accessible path. A new parking lot was built in Barnickel Park, and the existing half-basketball court was improved.